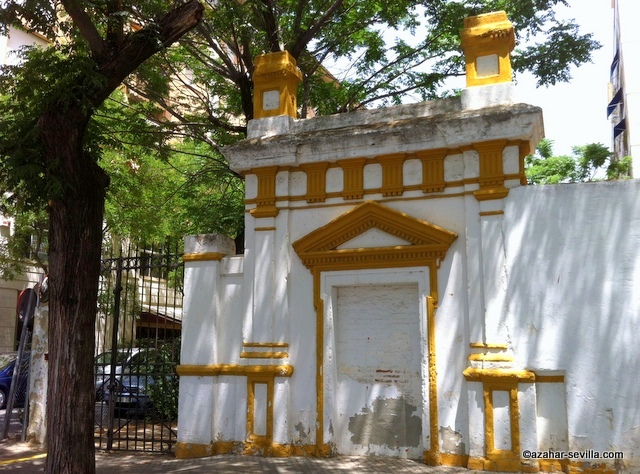 Halfway up Avenida Eduardo Dato, on the corner of Calle Diego Angulo Iñiguez opposite the Buhaira Palace Gardens, stands a short section of apparently functionless wall with a bricked up doorway to a small vacant lot. There’s no plaque, no sign, nothing to say that this is all that remains of the Plaza de Toros Monumental de Sevilla, the city’s ill-fated second bullring, first opened to the public in 1918, closed in 1921, and finally demolished in 1930. The driving force behind its construction was the famous bullfighter José Gómez Ortega ‘Gallito’, also known as Joselito, whose death in the ring on May 16, 1920, was a contributory factor in its closing. In 1915, when construction started, this was a ‘greenfield’ site a short way outside the city. Demolition made way for the new suburbs that now spread out to Nervion and beyond. I knew of the existence of the Monumental before I discovered this, but even such a small piece of its actual physical presence makes it much more real. The architects were José Espiau y Muñoz and Francisco Urcola Lazcanotegui, whose other works include the Hotel Alfonso XIII, and the Adriática at the end of Avenida Constitución. La Monumental tapas bar is located on the old site and is filled with bullfighting memorabilia including framed contemporary newsclippings about Seville’s forgotten bullring.